Description: - A pack of 10pcs model LED street lights - Each has double lamppost, completed with wires and bulb - Mainly used to decorate your model layout - Voltage: DC 3V - Height: Approx. 6cm /2. Trending at C $13.13eBay determines this price through a machine-learned model of the product's sale prices within the last 90 days. Light Source: LED (Warm White). Scale: 1:200. 10x LED Model Lamp. We wll check each item clearly before we sent it out. Color: Black. White to Negative (-). We would be with you to resolve the case. 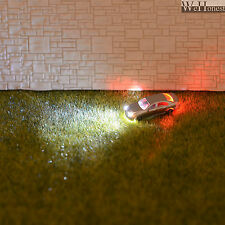 Lighted Model Cars with LEDs. Perfect for Model Train Set Landscape. Z Scale 1:220. Reference Z Scale 1:220. Size in mm: Approx. 22 mm (L) x 7mm (W) x 6mm (H). Random color and style. Buy It Now Price is for 10 pcs. 5x LED Model Lamp. Light Source: LED (Warm White). Scale: 1:200. You may also like. Color: Black. We would be with you to resolve the case. Power Cable Complete with Wires and Bulbs. 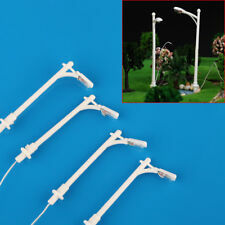 Description: 100% Brand new & High quality Mainly used to decorate your model layout These delicate model street lights are mainly used in teaching,photography and various kinds of scene model. Each of them is completed with wires and has single heads, which can be lighten with 6V power. 10x LED Model Lamp. Light Source: LED (Warm White). Scale: 1:200. You may also like. Color: Black. We would be with you to resolve the case. Power Cable Complete with Wires and Bulbs. Mainly used to decorate your model layout. Each has single head,completed with wires and bulbs. Main Color:White. 5x LED Model Lamp. Light Source: LED (Warm White). Scale: 1:300. You may also like. Color: Black. We would be with you to resolve the case. Power Cable Complete with Wires and Bulbs. 10x LED Model Lamp. Light Source: LED (Warm White). Scale: 1:300. You may also like. Color: Black. We would be with you to resolve the case. Power Cable Complete with Wires and Bulbs. Light Source: LED (Warm White). 10x LED Model Lamp. Scale: 1:50. Color: Black. White to Negative (-). We would be with you to resolve the case. Otherwise, we will relist the item and report an Unpaid strike. These Z scale lights are made of plastic & are black in color. These 1:220 scale lights run on max. 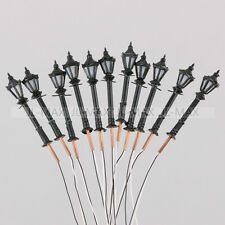 This set of lights for model trains are perfect for Z scale model trains. Each Z scale light is approx. Light Source: LED (Warm White). 5x LED Model Lamp. Scale: 1:200. Color: Black. White to Negative (-). We would be with you to resolve the case. Otherwise, we will relist the item and report an Unpaid strike. Light Source: LED (Warm White). 10x LED Model Lamp. Scale: 1:200. Color: Black. White to Negative (-). We would be with you to resolve the case. Otherwise, we will relist the item and report an Unpaid strike. 5x LED Model Lamp. Light Source: LED (Warm White). Scale: 1:50. You may also like. Color: Black. We would be with you to resolve the case. We look forward to serving you. Power Cable. Light Source: LED (Warm White). 5x LED Model Lamp. Scale: 1:300. Color: Black. White to Negative(-). We would be with you to resolve the case. Otherwise, we will relist the item and report an Unpaid strike. Light Source: LED (Warm White). 1x LED Model Lamp. Scale: 1:200. Color: Black. White to Negative (-). We would be with you to resolve the case. Otherwise, we will relist the item and report an Unpaid strike. Light Source: LED (Warm White). 5x LED Model Lamp. Scale: 1:50. Color: Black. White to Negative (-). We would be with you to resolve the case. Otherwise, we will relist the item and report an Unpaid strike. 10x LED Model Lamp. Light Source: LED (Warm White). Scale: 1:50. You may also like. Color: Black. We would be with you to resolve the case. We look forward to serving you. Power Cable. Light Source: LED (Warm White). Scale: 1:300. 10x LED Model Lamp. We wll check each item clearly before we sent it out. Color: Black. White to Negative(-). We would be with you to resolve the case. Otherwise, we will relist the item and report an Unpaid strike. Light Source: LED (Warm White). Scale: 1:300. 1x LED Model Lamp. We wll check each item clearly before we sent it out. Color: Black. White to Negative(-). We would be with you to resolve the case. Otherwise, we will relist the item and report an Unpaid strike. Z gauge model railway supplies for all miniature architectural model projects which are planned at scale 1/220. Z scale lights without any light functions. of Z scale lights made of plastic. Scale: 1:220. Findings and Tools. Ribbon, Cords. Clothing, Shoe Care. Baby Children Supplies. - Each has double heads, completed with wires and bulbs. - Mainly used to decorate your model layout. - Material:Stainless steel tube. Description: Condition: 100% brand new Height(without root): Approx. 45mm/1.77" Height of root: Approx. 6mm/0.24" Scale: 1: 300 material: plastic Qty: 40pcs Color: white Perfect for layout or diorama Note: Item's color might be different from the picture because of the Aberration. Light Source: LED (Warm White). Scale: 1:50. 10x LED Model Lamp. We wll check each item clearly before we sent it out. Color: Black. White to Negative (-). We would be with you to resolve the case. Otherwise, we will relist the item and report an Unpaid strike. Light Source: LED (Warm White). 1x LED Model Lamp. Scale: 1:50. Color: Black. White to Negative (-). We would be with you to resolve the case. Otherwise, we will relist the item and report an Unpaid strike. Light Source: LED (Warm White). 1x LED Model Lamp. Scale: 1:300. Color: Black. White to Negative(-). We would be with you to resolve the case. Otherwise, we will relist the item and report an Unpaid strike. Z gauge model railway miniatures made at 1:220 scale. of non electric Z scale lights. Decorative scale modeling miniatures for your architectural modeling landscapes at scale 1/220. 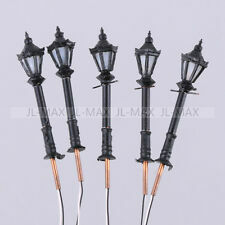 of decorative Z scale lights with a height of 32mm. Nice quality working lamp with wiring. - Scale: 1:200. Package Include:20 pcs model street lights Country/Region of Manufacture China Brand Unbranded MPN Does not apply Gauge 1:200 Colour White EAN Does not apply Material Plastic UPC Does not apply. Package Include:40 x 1:300 model street lights Country/Region of Manufacture China Brand Unbranded MPN Does not apply Colour White Gauge 1:300 EAN Does not apply Material Plastic UPC Does not apply. Light up your model layout with this great model lamppost! Light up your model layout with this great model lamppost! Light up your model layout with this great model lamppost!